Why does Moscow need Syrian Kurdistan? Why is the Kremlin supporting the Syrian Kurds, who are now complicating the regional picture by pushing for federalization, and how will this affect Russian assistance to the Bashar al-Assad regime? In the Syrian conflict, which has lasted for more than five years, Moscow's support for the Syrian Kurds has been a tactical instrument and is opportunistic in nature, with Russia remembering them mainly after the deterioration in its relations with Turkey in November 2015. Moscow understands that the Turks always react tempestuously to any issue related to the Kurds. For example, Russia's initiative to open the (first in the world – RBTH) Syrian Kurd representative office in Moscow in the middle of February this year says that first and foremost Russia wishes to prick Turkey. At the same time the Syrian Kurds represent for Turkey no more than an irritating factor: Within the entire Kurdish movement they constitute only a peripheral structure and within the Syrian domestic political context they do not play the role that they play in Iraq and Turkey. Kurds declare Federation of North Syria – what's next? They are also dependent on the Iraqi Kurds and on their organizations – primarily on the Kurdistan Democratic Party and on the clan of Iraqi Kurdistan's president, Masoud Barzani. In these conditions the Syrian Kurds will not be able to promote Russian interests in the region. This is why Moscow is unlikely to have a long-term strategy concerning the ethnic group. 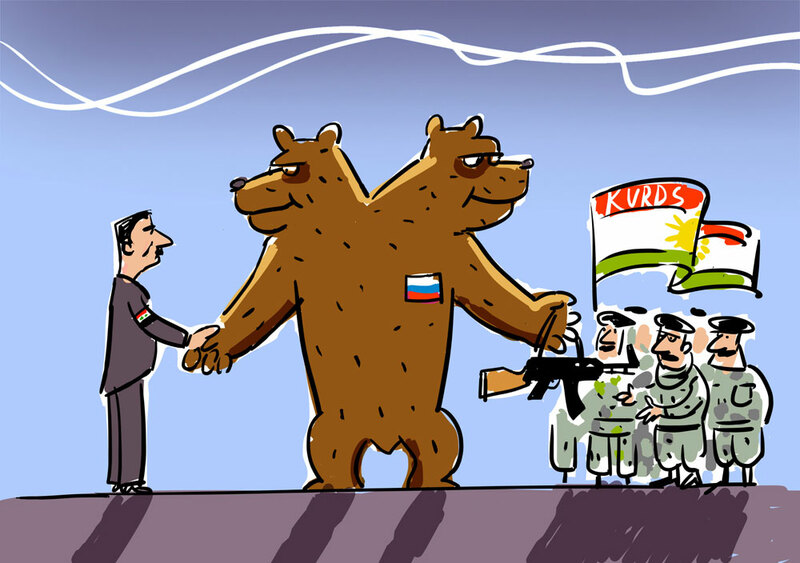 But at the same time, for Russia the Kurds' fight against the extremists of Islamic State (ISIS) is very important. Among all the domestic political forces of Syria, the Kurds are crucial participants in the fight against the radical Islamists. Obviously their position will remain unchanged since many of them are not Muslims but Yazidis, an ethno-religious group that practice a religion some say is based on Zoroastrianism. From the viewpoint of radical Islamists, the Yazidis are heretics that must either be destroyed or converted to Islam. However, the Syrian Kurds are also creating difficulties for Russia by disrupting the rather harmonious ties that Moscow currently enjoys with the Bashar al-Assad regime. This is obviously related to them declaring the establishment of a Kurdish federative region in the north of Syria, which basically implies the de facto partitioning of the country. Regarding the federalization of Syria, Moscow has found itself in a difficult position since both the Kurds and the Assad government are Russia's allies. In such a situation Moscow, stuck between two sworn allies, will try to use the sleekest wording, since by and large Russia is indifferent about whether or not Syria will be federalized. Russia has a significant arsenal of resources for helping the Syrian Kurds, from diplomatic support to supplying weapons. In particular, Moscow helps the Kurds with its air force, with those forces that remain in Syria. Yet, the U.S. also helps the Kurds, giving them more space for maneuvering and weakening their dependence on Russia. As a result, Russia must find the right tack in this complex situation. The affair is not made any simpler by the fact that earlier neither Russia nor the USSR had any experience with this ethnic group. Moscow only had close ties with the Iraqi Kurds. And the most difficult aspect about the situation is the tensions between the Syrian government and the Kurds. The latter will doubtlessly remind Damascus of the 1962 census, which did not take into consideration a large part of the Syrian Kurds, as well as the operations of 1963 and 1986 in which Kurds were killed. The Syrian Kurds are now trying to strengthen the existing status quo. They have conquered territory but are not participants of the Geneva talks. That is why they are trying to become a participant of Syria's regulation process. Thus the demand for federalization. In such a context Russia presents itself as a sort of guarantor, a co-sponsor of the Geneva process and a mediator, and will not make any drastic moves. Sergei Demidenko is a Middle East expert and professor at the Russian Presidential Academy of National Economy and Public Administration’s Institute of Social Sciences.